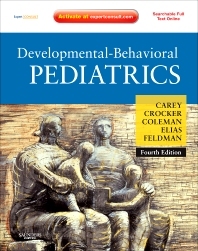 The fourth edition of Developmental-Behavioral Pediatrics—the pioneering, original text— emphasizes children’s assets and liabilities, not just categorical labels. It includes fresh perspectives from new editors—Drs. William Coleman, Ellen Elias, and Heidi Feldman, as well as further contributions from two of the original editors, William B. Carey, M.D, and Allen C. Crocker, M.D. This comprehensive resource offers information and guidance on normal development and behavior: genetic influences, the effect of general physical illness and psychosocial and biologic factors on development and behavior. It is also sufficiently scholarly and scientific to serve as a definitive reference for researchers, teachers, and consultants. With a more user-friendly design and online access through Expert Consult functionality, this resource offers easy access comprehensive guidance. Features new chapters dealing with genetic influences on development and behavior, crisis management, coping strategies, self-esteem, self-control, and inborn errors of metabolism to cover the considerable advances and latest developments in the field. Focuses on the clinical aspects of function and dysfunction, rather than arranging subjects according to categorical labels. Emphasizes children’s assets as well as their liability so you get a well-developed approach to therapeutic management. Concludes each chapter with a summary of the principle points covered, with tables, pictures and diagrams to clarify and enhance the presentation. Offers a highly practical focus, emphasizing evaluation, counseling, medical treatment, and follow-up. Features superb photos and figures that illustrate a wide variety of concepts.